If you are a massive fan of CPBL, then you probably did not miss the Opening Weekend. On March 24, the Uni-Lions defeated Fubon Guardians 1-0 on their home opener. 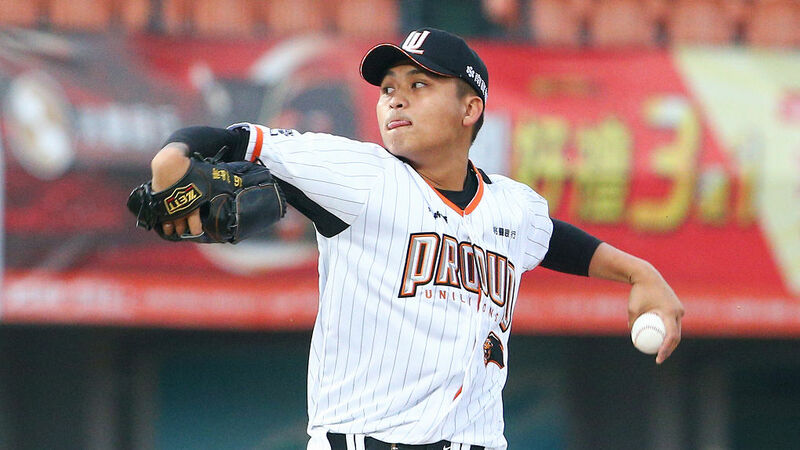 23-year-old left-hander 江辰晏 (Chiang Chen-Yen) tossed six scoreless innings and punched out seven Guardians while allowing four hits along with three walks. The crafty lefty sat his fastball around 87-91 mph, but the effectiveness of his “average velocity fastball” has fooled the Guardians lineup through six scoreless innings. We want to introduce a pitching concept; perhaps “strategy” might be a better word to describe it. The study of EV (Effective Velocity), somehow defined as “how location affects hitters’ perceived velocity of a baseball pitch”, had been around the major leagues for a few years. According to Carlos Peña, current MLB Network Analyst and former All-Star, Effective Velocity may eliminate the hitter’s predictability and take away the reaction time. We sketched the EV charts for both Right-handed batter and Left-handed batter, from pitcher’s view. We will guide you through two scenarios from Sunday night. Top of the second, 江辰晏 (Chiang Chen-Yen), facing the three-time CPBL MVP 林益全 (Lin Yi-Chuan) in a full count situation. Chiang powered a 88 mph fastball up and in the plate. Although 88 mph might not be able to quiet Lin, the Effective Velocity of the pitch might be around 91-92 EvMPH (see left-handed batter chart above), which Lin fouled off behind the plate. On the next pitch, Chiang tossed a 69 mph curve far away from the strike zone which made Lin swung and a missed before heading back to the dugout. From this above the home plate angle, we can see that Lin was waiting for the breaking ball. Unfortunately, the 69 mph curve was recorded as 66-67 EvMPH, which created a 25 mph difference between the two pitches. Another scenario, power pitcher Henry Sosa kicked a 95 mph fastball up and in towards 郭阜林 (Kuo Fu-Lin), by applying the EV chart which converted to a 99 EvMPH bullet which causing Kuo to missed it completely. Sosa’s next pitch, on a 2-1 count for Kuo, he did not miss the opportunity and slashed a single on a 93 mph pitch down and away from the zone. According to EV, the 93 mph fastball is converted to an 89 EvMPH pitch. At that speed, it is relatively a simple task for the right-handed slugger. Kuo Fu-Lin finished the day with a double and a single off Sosa while scoring the only run of both teams. Whether EV is a concept, a strategy or a tool for pitchers to optimise their performance, there is no doubt that Chiang Chen-Yen and Lin Yu-Le made great use out of it through the entire night against the Guardians on March 24. Nice work. Excellent breakdown and GIFs.